The Green Rooms — Danielle Townsend Design Graphic Design and Brand Identity Design Dublin, Danielle Townsend Design is a Graphic Design and Visual Thinking agency based in Dublin. 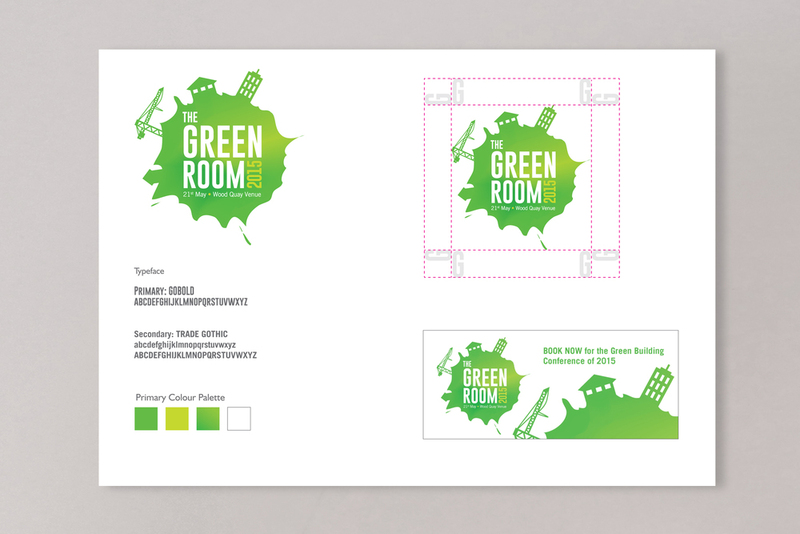 To create a brand for a boutique conference organized by the Irish Green Building Council (IGBC). The conference is a gathering of targeted professionals concerned with promoting a sustainable built environment. The event will take place in 21st May as stated. The event needed a name so after much discussion and brain-storming "The Green Rooms" was born. It was felt to fit the scale of the conference and also mirrors the overall brand image we have created for the IGBC over the past 2 years. The splash was developed after a number of iterations were created. The marque was initially devised as a elliptical shape to communicate how the debate is coming full circle - but was later revised to the splash for its sense of immediacy & dynamism. The crane and buildings were further added to show the movement in the industry which has come a long way in the past few years - and so too has the debate around sustainability. The type treatment was devised for its clarity and semi-industrial feel which suits the overall tone of the brand. Brand guidelines, web banners and advertising for Passive House + were also created to support the event marketing strategy.